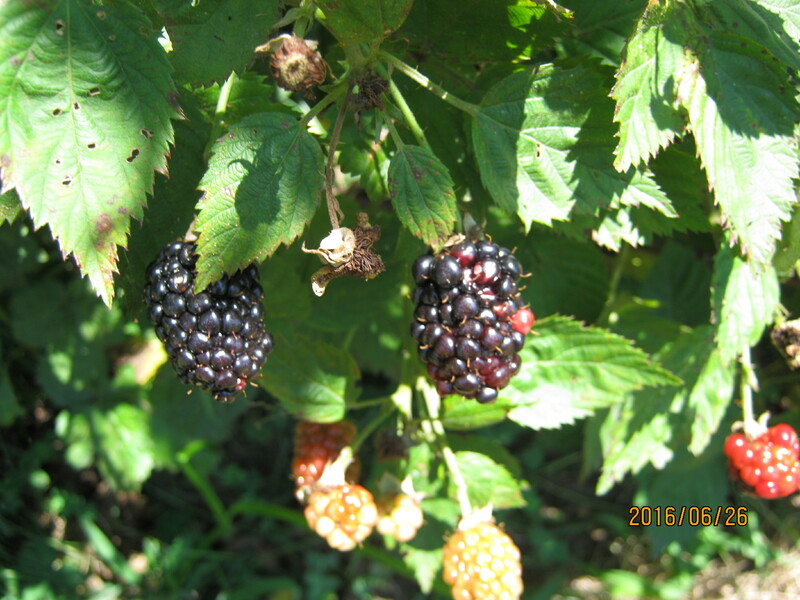 CLICK ON ANY PHOTO TO SEE IT LARGER AND USE YOUR BROWSER BACK ARROW TO RETURN TO THE BLOG. 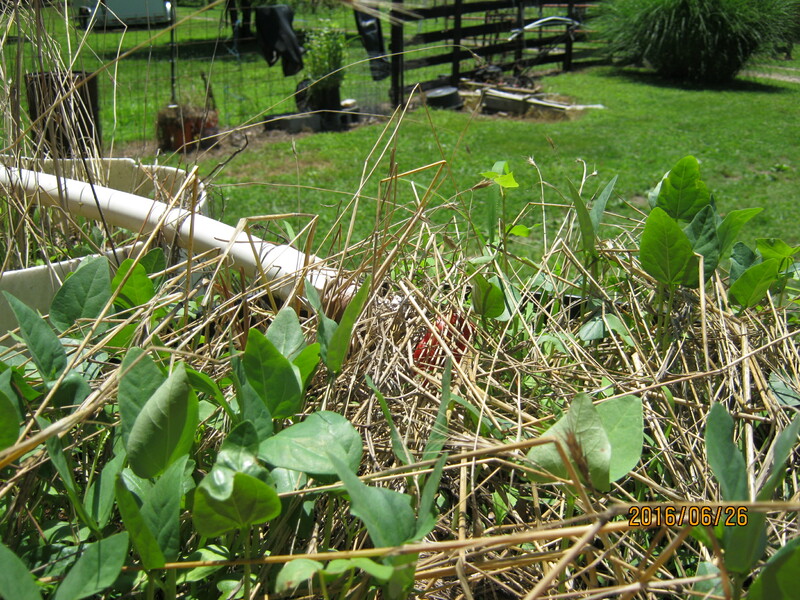 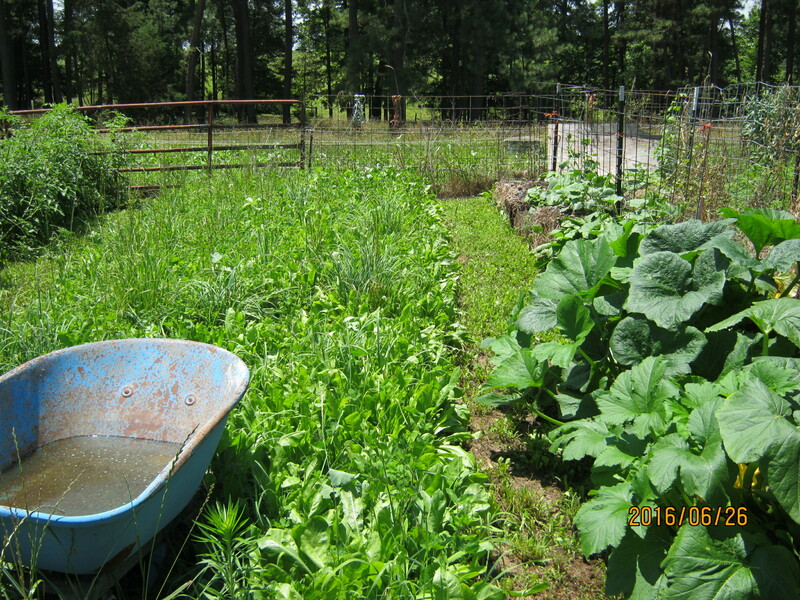 THIS IS THE PATCH OF MOSTLY CHICORY AND CLOVER THAT IS IN THE GARDEN…WELL THE WHOLE GARDEN HAS IT BUT i MOW PATHS BETWEEN THE ROWS. 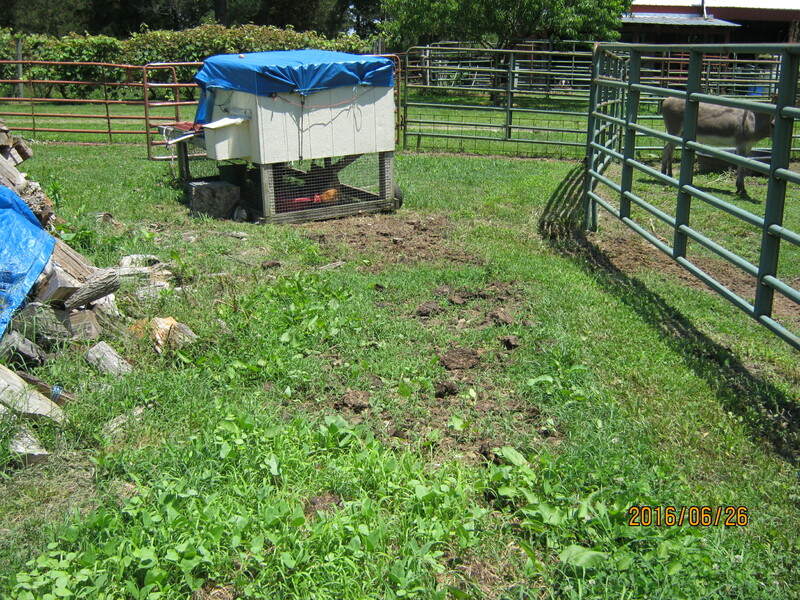 DECIDED A COUPLE OF WEEKS AGO TO LET THIS PATCH GO AND SEE WHAT A COVER IT MAKES. 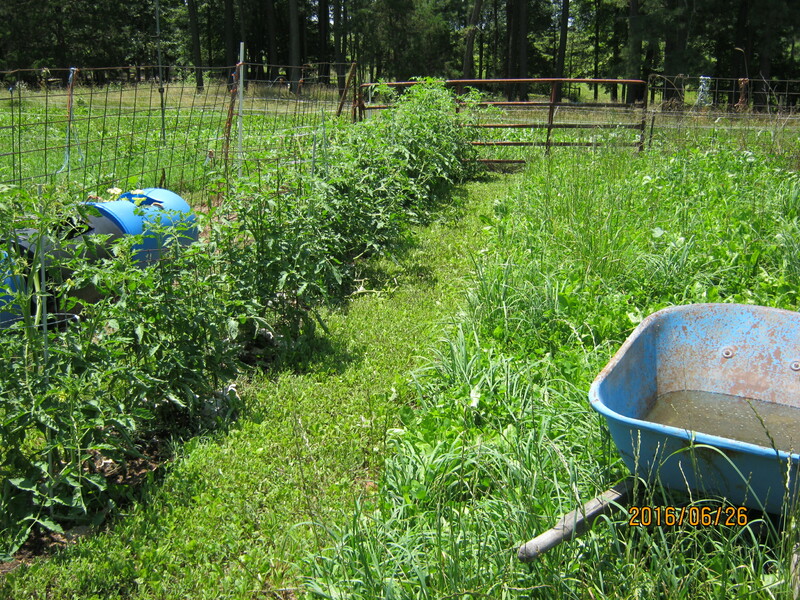 WILL BE THE SPOT FOR TOMATOES NEXT YEAR. 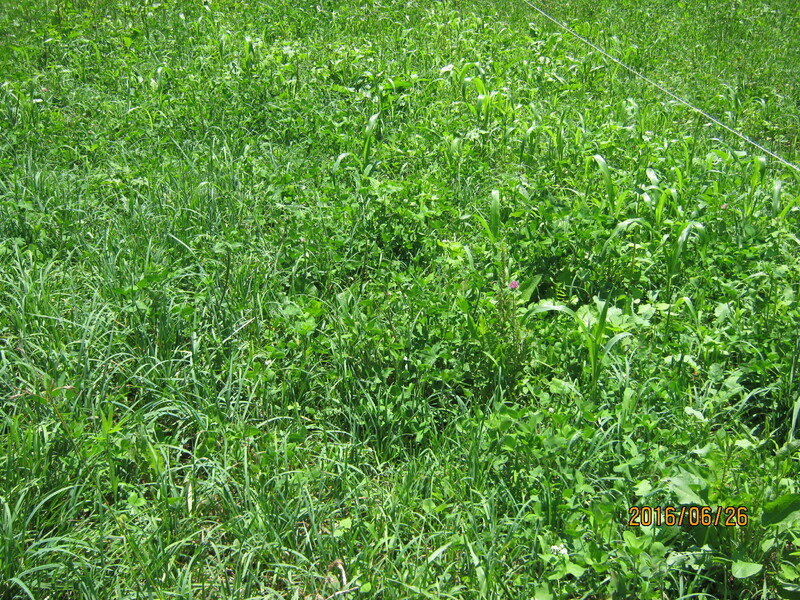 THIS IS COVER CROP BROADCAST ON A SACRIFICE ARE IN THE HORSE SIDE…SOWN ABUT SIX WEEKS AGO AFTER GRAZING. 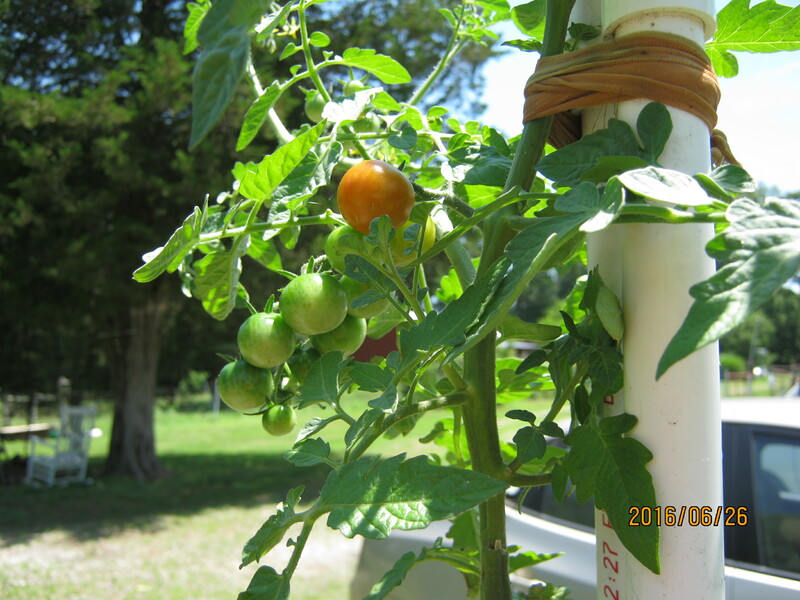 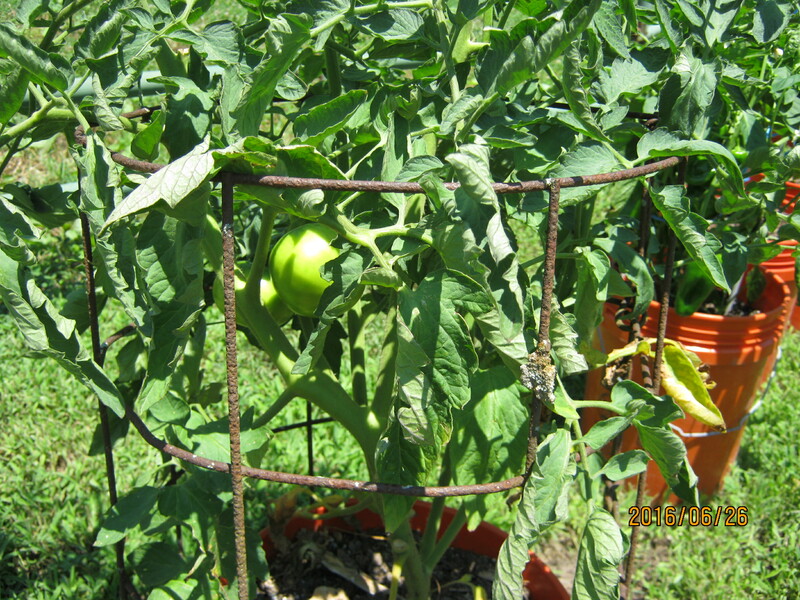 PICKED MY FIRST TOMATOE FORM THE TOWER AS WELL….OKAY IT IS A CHERRY TOMATO BUT ITS MINE. 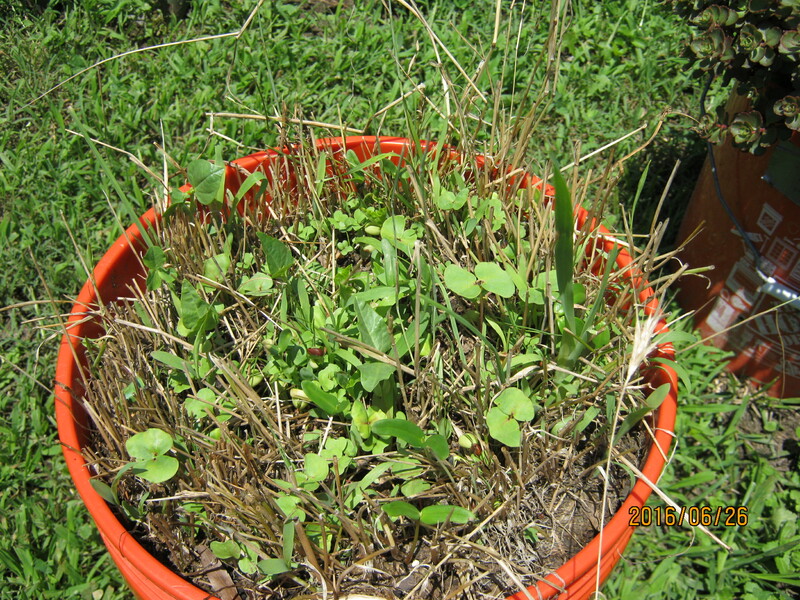 AND THE WIND HAS BROKEN THIS PLANT OFF TWICE. 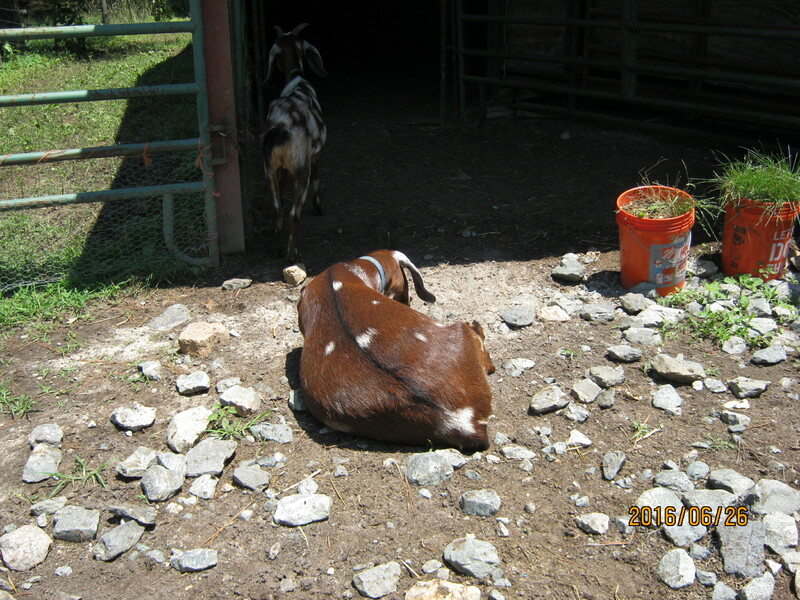 NIMROD LIKES TO LAY IN THIS SPOT TO WORK ON HIS TAN. 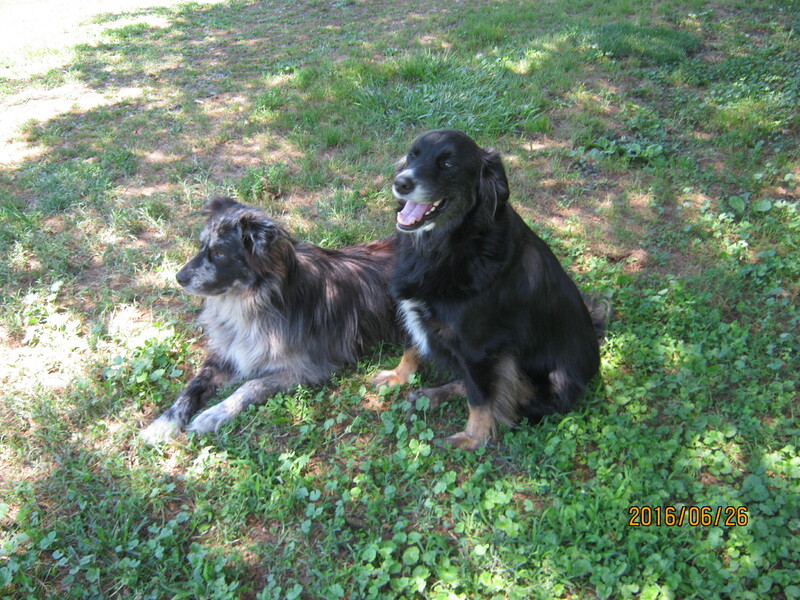 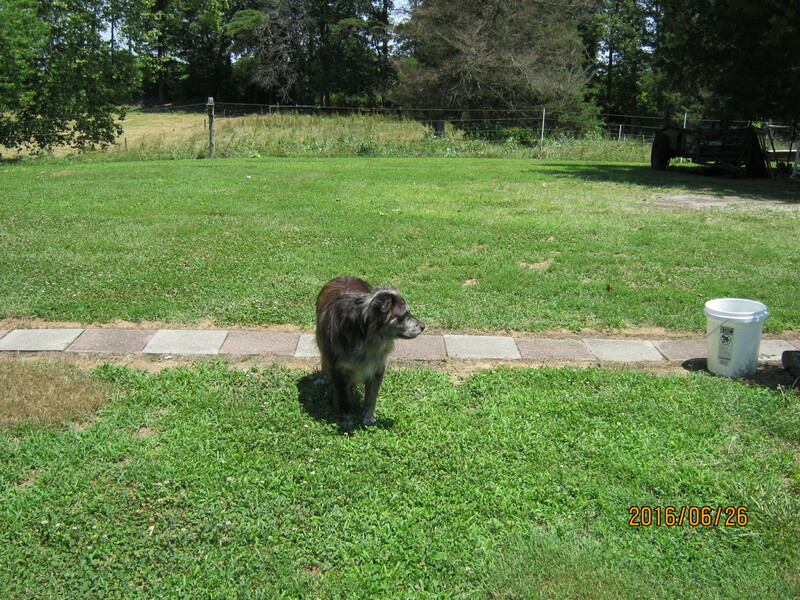 MARIES GUARD DOG….HE WILL ONLY LEAVE HER TO GO OUTSIDE WITH ME. 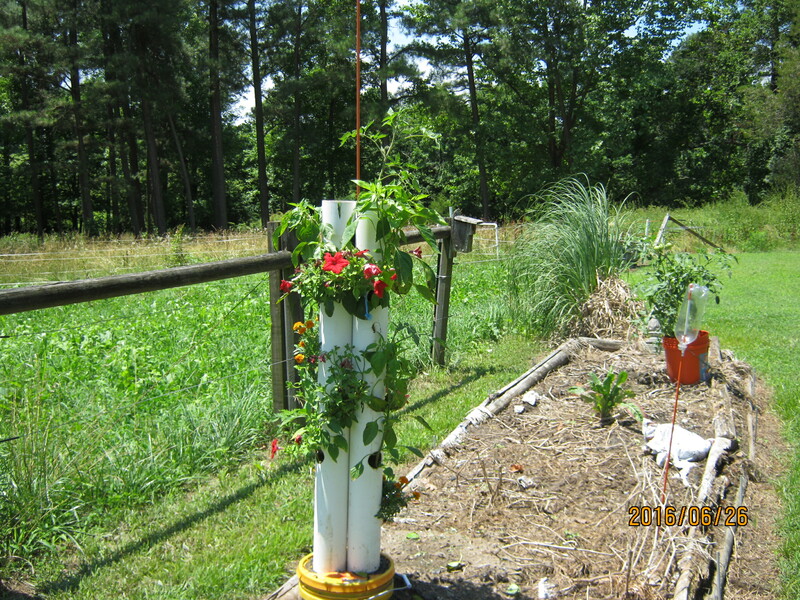 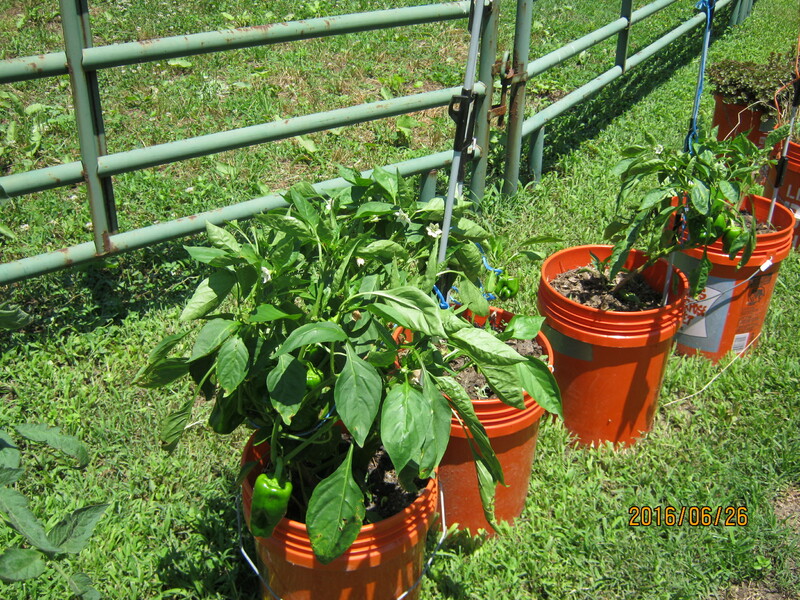 PEPPERS ARE DOING OKAY EXCEPT THE DEER KEEP EATING THEM…ATE ONE DOWN TO THE STALK THE OTHER NIGHT AND WAS STANDING THERE WATCHING ME WHEN I WENT TO WORK IN THE MORNING. 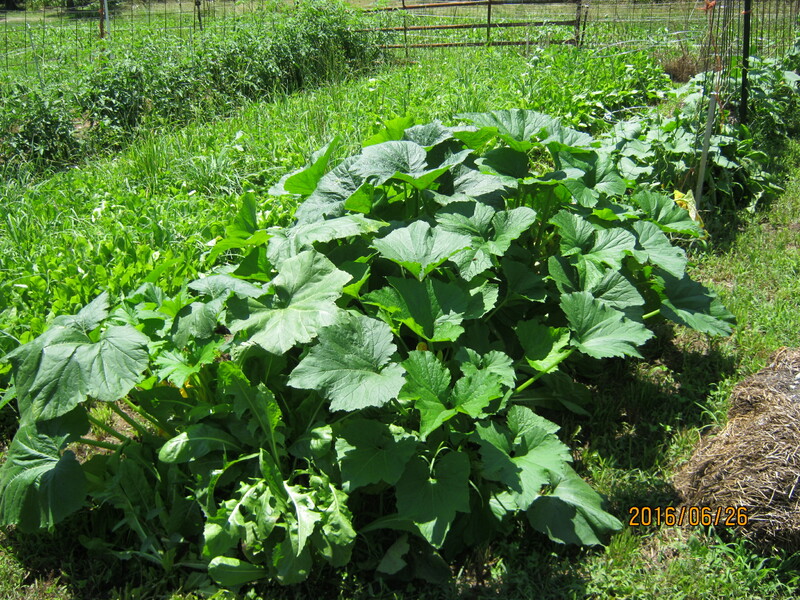 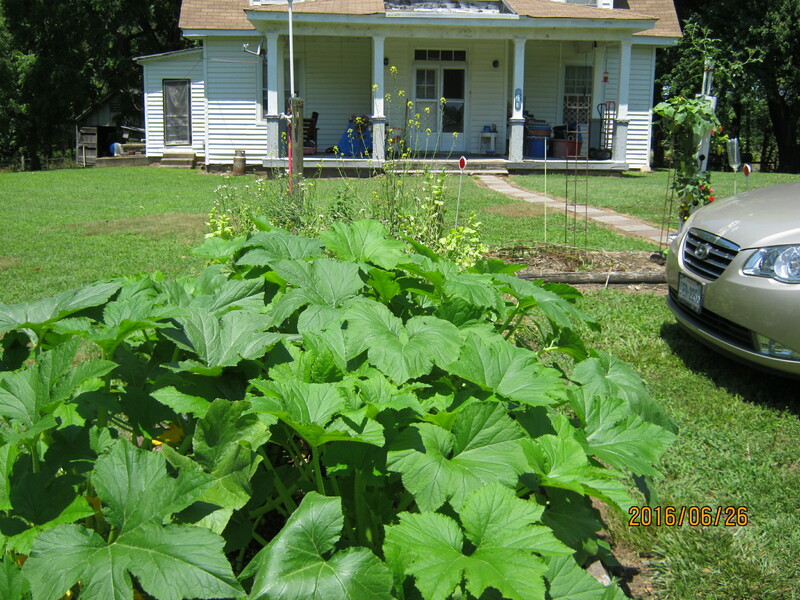 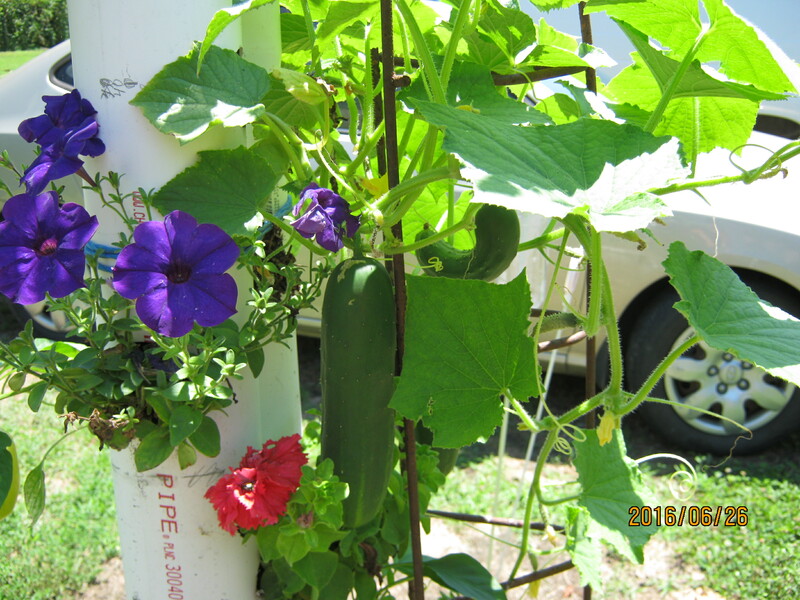 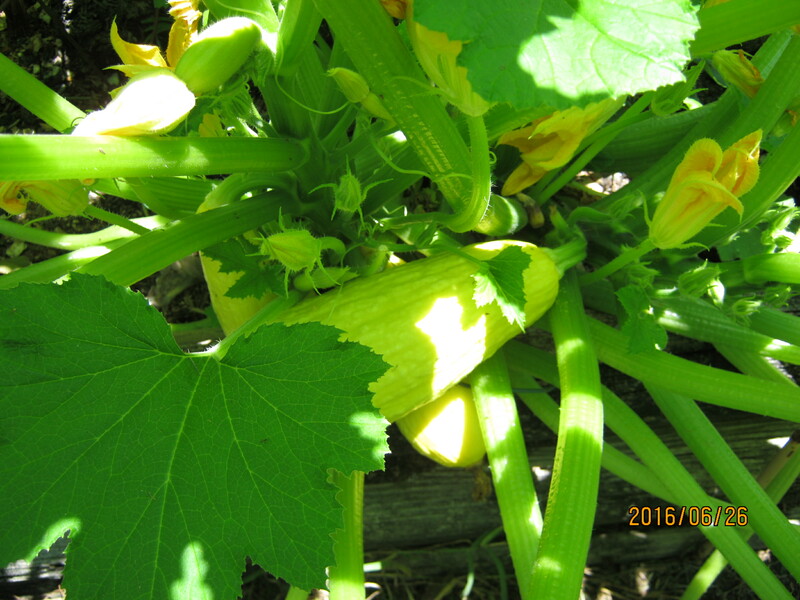 SQUASH ARE BLOOMING AND BOOMING…PICKED THREE TODAY THE SIZE OF FOOTBALLS AND GAVE THEM TO THE CHICKENS. 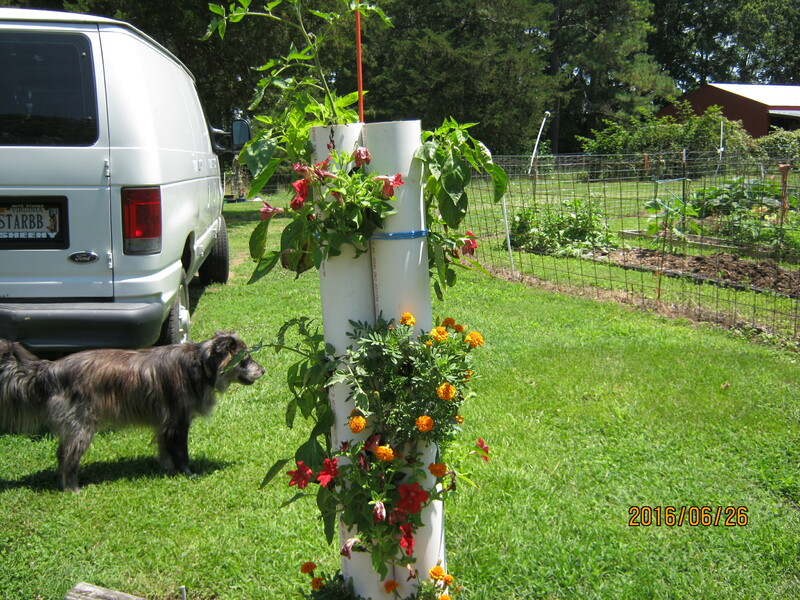 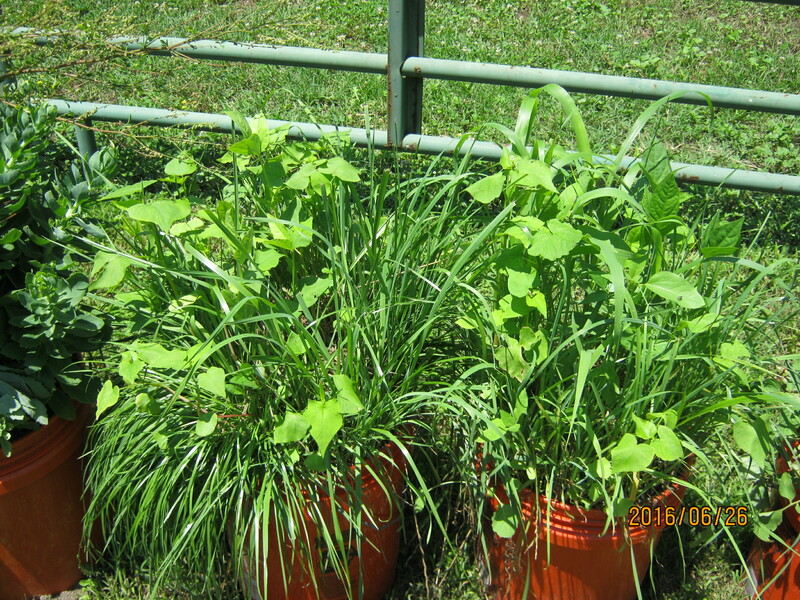 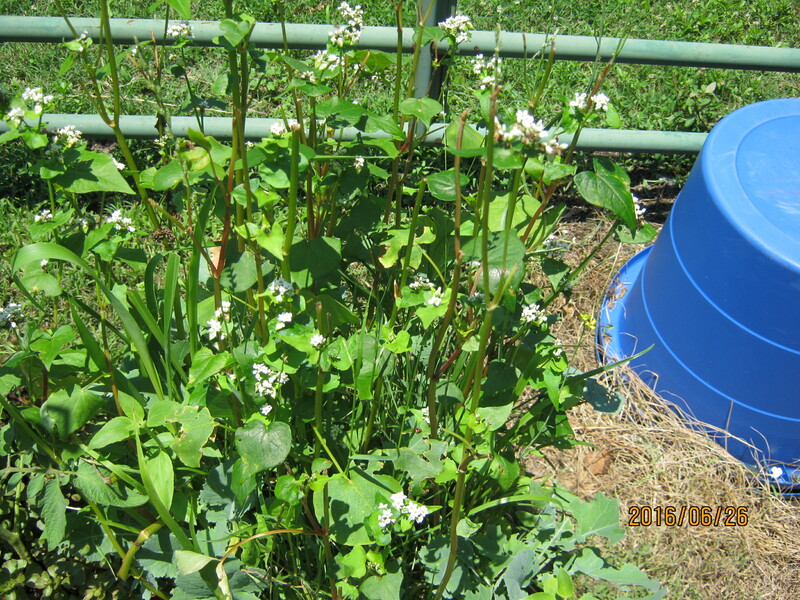 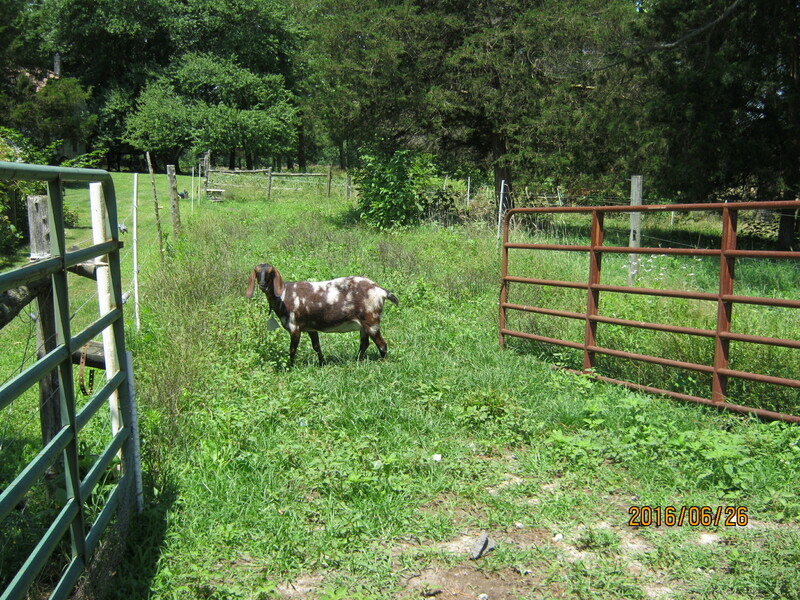 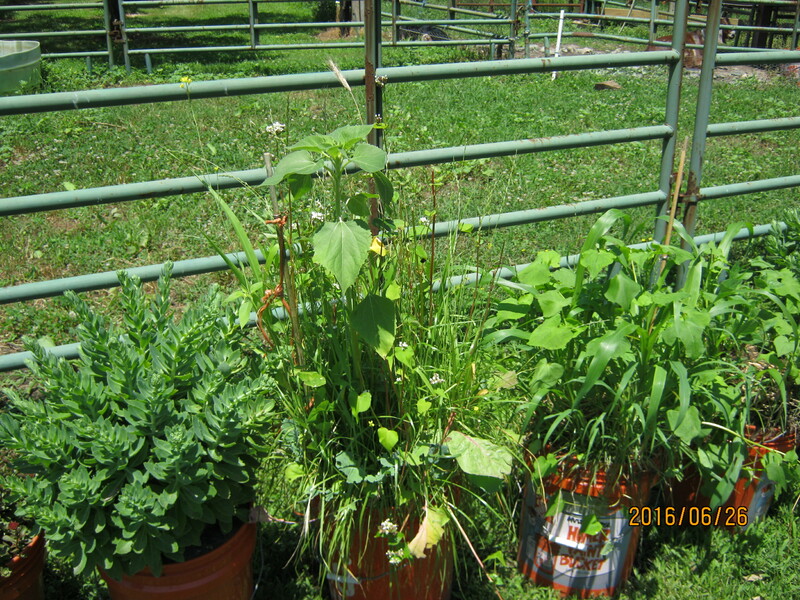 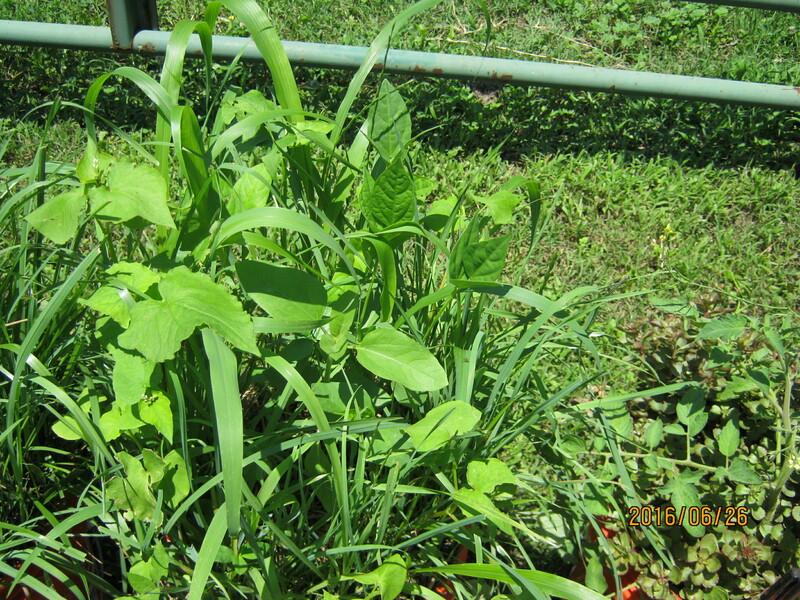 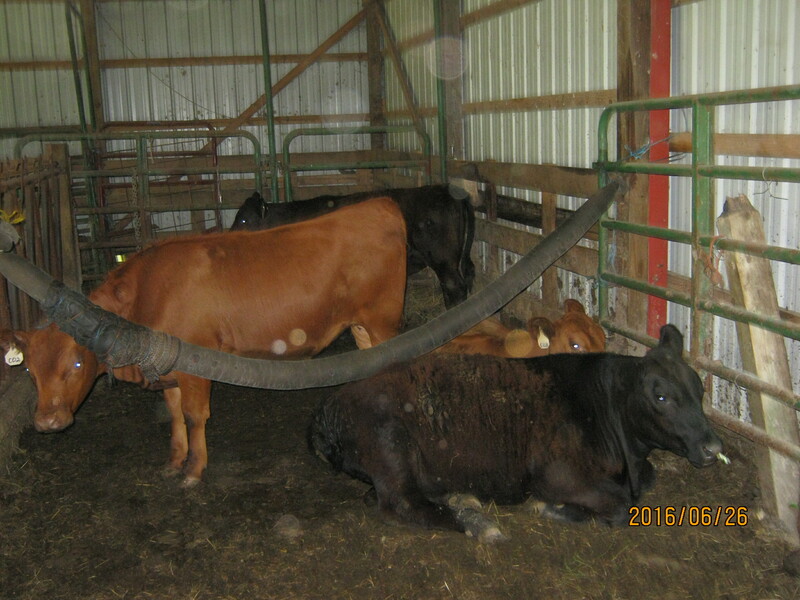 SUMMER COVER CROP BUCKET 1….THE DEER LIKES THIS AS WELL…KEEPS IT MUNCHED. 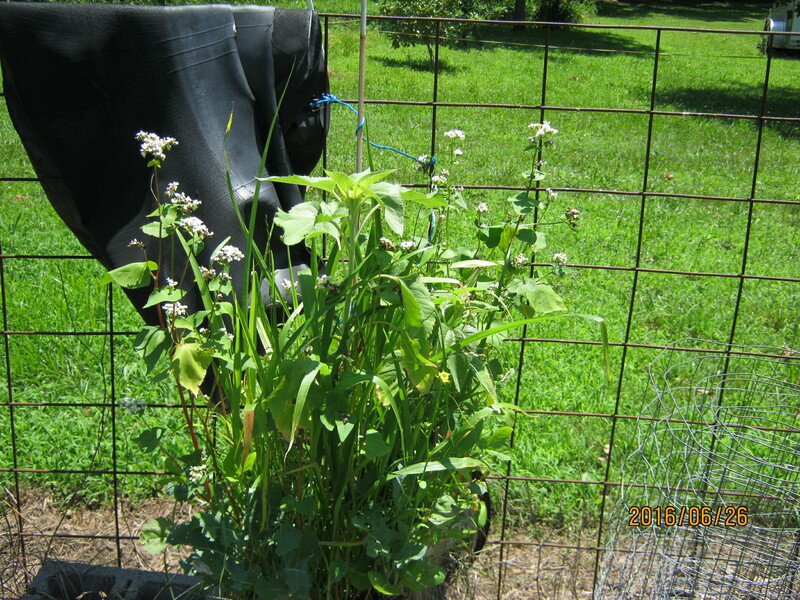 TWO BUCKETS OF THIRD PLANTING SUMMER COVER…PLANTED EARLY JUNE…THESE BUCKET HAD COOL SEASON CROP…i CUT OFF THE COOL SEASON…SCATTERED THE WARM SEASON SEED AND CHOPPED UP THE COOL SEASON RESIDUE ON TOP OF THE SEED…IT WAS MOUNDED UP SIX INCHES AND THE SUMMER COVER IS COMING THRU IT. 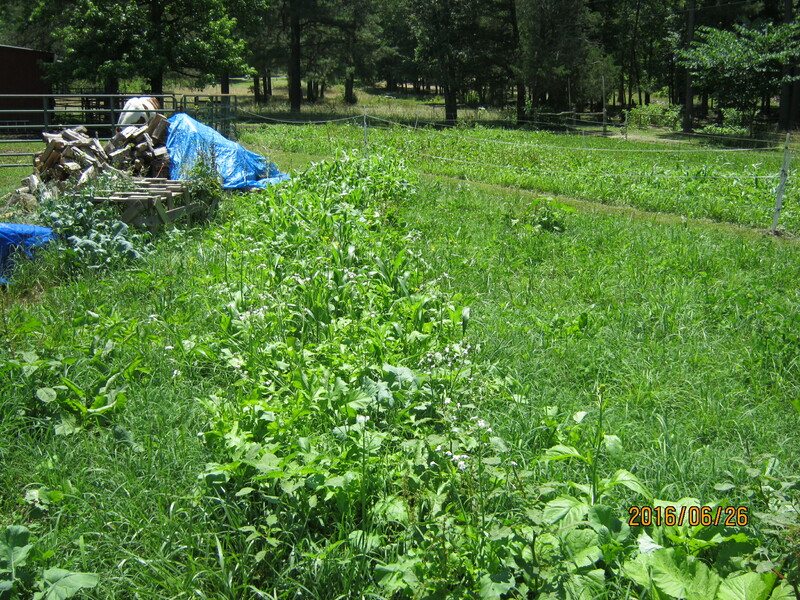 OLDER CHICKEN TRACTOR TRACKS….NOW THE HORSES GRAZED THIS LOT IN EARLY JUNE AND i MOWED IT AFTER THEY CAME OUT SO THIS IS ALL REGROWTH. 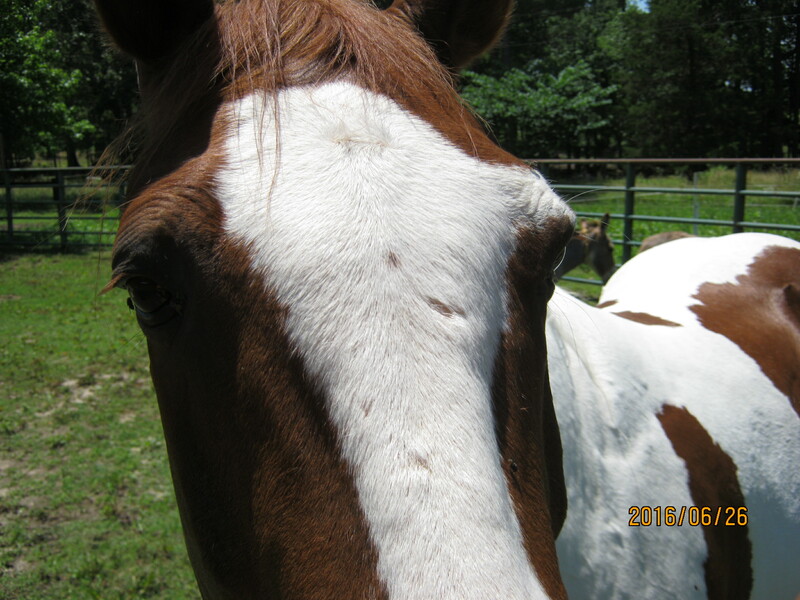 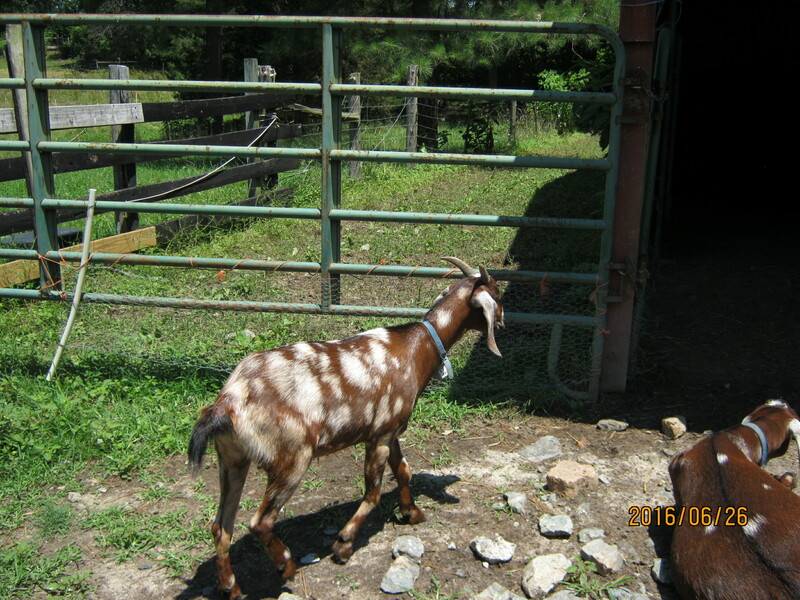 PETE IS ALWAYS CURIOUS AND ASKING ……WATCHA GOT?